Rob Vary recently celebrated his 10th anniversary with BioEYES. Since joining us, he calculates that he has worked with approximately 15,500 students and 229 teachers at 112 schools. Read on to learn more about Rob! As of this writing, just over ten years. I started in August, 2008. I am a Science Outreach Educator. My primary roles are to lead BioEYES in the classroom and to train teachers prior to us coming out to their classrooms. In addition, I build and maintain the BioEYES website, design and print our student journals, assemble our quarterly newsletter, and analyze the data from our student assessments. 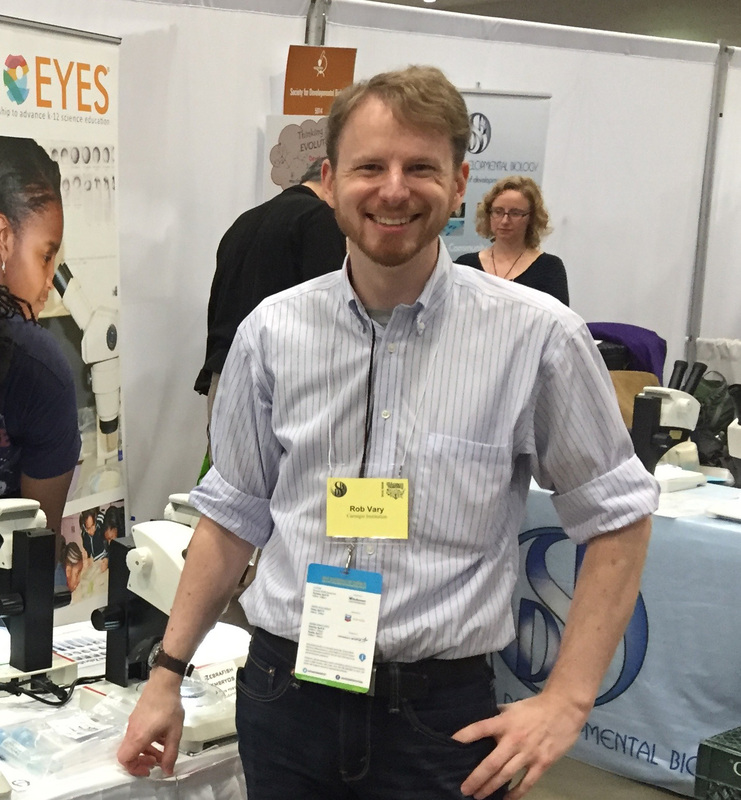 Between graduating college and joining BioEYES, I spent five years as part of the Traveling Science Program at the Maryland Science Center. We went to schools all over the mid-Atlantic to do assemblies and classroom programs where we would blow things up, set things on fire, freeze things in liquid nitrogen, etc. What brought you into the realm of informal science education and working for a non-profit? It's sort of a natural fit for me! I've always loved both science and performing. In college, this led me to majoring in physics but spending all of my spare time working in the theater, primarily acting in shows. Sometime around the beginning of my junior year I combined the two by working in the college planetarium, which turned into me writing, producing, and presenting four planetarium shows as my senior project. When I graduated, I wanted to get a job sort of like that, blending the science and the performing that I enjoyed, but I knew I didn’t want to be a classroom teacher. I started by looking for planetarium jobs, which took me to the Maryland Science Center as described above. That gave me the informal science education experience I needed to be hired by BioEYES despite not having much of a background in biology, specifically. It's not the most original answer — pretty much all of us say the same basic thing! — but it’s the chance to work with the students. It's the moment that they suddenly get the thing they were struggling to understand, when you see them get so excited about working with and learning about live animals, and it's when they look under the microscope and see a beating heart, not as a video, not as a special effect, but in real life right before their eyes. In that moment, they’re hooked. Maybe not forever, but they’ll still remember that moment and remember how exciting it can be to learn about how the world works. Who knows where that might lead them! I try not to play favorites. They get snippy and uncooperative when they’re jealous. I love to read, and especially love chances to read aloud. I still act in community theater now and then, maybe a show or two a year. I don’t get away nearly as often as I would like, but I love to travel pretty much anywhere. The mountains, the shore, the woods, the city. I’m always interested in going someplace I haven’t been before. I haven’t done much with it in recent years, but I am a fairly accomplished balloon twister.